Started of the day with a visit to Gommecourt and Rossignol Wood, followed by a long walk around High Wood. Ended the day with a visit to Montauban. Ammunition and trenches seemed to be the focus of the day so that's what this blog entry will concentrate on. Obviously right from the start I will emphasise NEVER touch any unexploded shells etc - they are still dangerous and this blog accepts no liability if you go bang! The first photo shows a German granatwerfer, literally a grenade thrower along with a British Webley pistol round. Second photo shows three German 'stick grenades'. Third photo shows a couple of shells with the forth photo a close up of one of the fuses. Fifth photo shows shell and collapsing dugout in Rossignol wood. Sixth photo shows part of the remaining German trenches in Gommecourt Park. Last two photos are of a large dump of shells near High wood. More tomorrow. A long day in the field today with glorious weather. Basically covered the Thiepval-Courcelette-Boom Ravine areas, but this post will concentrate on some of the more poignant items that still turn up in the fields. Today we found the remains of lots of metal strips that were used to mark the original wooden crosses in the 1920's before the more permanent grave stones were added. To date, we have over 20 names, most buried in Regina Trench Cemetery, but two are in Courcelette Cemetery. One can only guess these metal strips were just dumped when no longer needed. One name we have is Private William Edward Newson, 244, 24th Battalion Australian Infantry. He enlisted on 15/3/15 and served at Gallipolli, landing on 30/8/15 and being evacuated on 1/1/16. He landed in France on 27/3/16 and was killed in action during the bitter fighting for Pozieres on 29/7/16. His medals were sent to his mother, who died and were then kept by his sister. There would seem to have been some bad family blood as his elder brother (actually the 'correct' next of kin after his mother) also tried to claim them. The sister, Mrs I O'Donnell moved to Paddington, London. In Boom Ravine we came across the bomb-disposal squad who blew up an 'unstable' shell. They also had several in the back of the van - quite how they decide which is stable and which is unstable is a mystery! It was all 'matter of fact' - one can only guess of the fuss that would be made in the UK! Image No 4: View of Newfoundland Park which is on the other side of the Ancre Valley, from the dominating heights of the Thiepval ridge. Again the front line trenches show up as chalk marks in the bare fields. A walk today around Serre, then over the Redan Ridge to Beaumont-Hamel in the morning. In in afternoon a walk around the area of Newfoundland Park. Serre, a German Fortress village, was the northern limit of the 1st July attack (a diversionary attack was made a little further north at Gommecourt). At Serre, the British had to attack up gently sloping ground towards the German line and most were annihilated within minutes by German machine guns which had not been dealt with during the preliminary barrage. Beaumont-Hamel was another German position of incredible strength. The village itself sat in a hollow between the Hawthorn and Redan Ridges and was flanked by machine guns on both ridges. A huge mine was blown under the redoubt on Hawthorn ridge, but the British were unable to seize the crater, allowing the Germans to re-establish machine guns in the position. It is easy here to visualize the attack of the 1st Lancs. Fusiliers, 86th brigade, 29th Div. They had tunnelled from the British front line to occupy a sunken road prior to the start of the attack on 1st July, had then to advance over an open field, then drop down a bank before advancing up a gentle slope towards the German front line. The battalion was cut to pieces in minutes of leaving the sunken lane. Newfoundland Park is a memorial park to the Newfoundlanders. The 1st Newfounland Battalion, part of 88 Brigade (the reserve Brigade of 29th Div), were ordered to attack despite the complete failure of the two main attacking brigades due to incorrect reports of troops fighting in the German reserve positions. The 29th Div history describes eyewitness accounts of the battalion advancing 'undaunted by a hail of machine gun fire' until only a hadfull of men were left (they suffered 90% casualties). Today the park is a preserved part of the battlefield (although actually from the 1918 lines). From the area of the park, good views across the Ancre Valley of Thiepval are to be had. In the bare fields, chalk marks can clearly be seen, actually the remnants of the chalk spoil from the deep German front line trenches and dugouts. Image No 2: Taken from German Front line, Beaumont Hamel. The cemetery is in no-mans land and the memorial and hedgerow in the background is the location of the sunken lane. Image No 7: Thiepval, across the Ancre Valley from vicinity of Newfoundland Park. The German Front line can be followed in the bare fields as chalk marks. Well, I'm back! My trip actually started on Fri 19th, having to travel up to Birmingham to meet up with my brother with whom I've been visiting the First War battle fields for the last 25 yrs. This allowed a stop off on part of the Eastern Command Line, but I will post about that at the end of the series of blogs on the Somme trip. It will signal a return to the original idea of this blog. So on the Sat drove down to the Somme via Aubers, Fromelles and Neuve Chapell. The British made attacks at both Aubers and Neuve Chapell in 1915 and a joint British/Australian attack was made at Fromelles in July 1916 as a diversion to prevent the Germans from moving reserves to the Somme battlefield. Originally only planned as an artillery diversion, through misunderstands, bad communication and planning it ended up as being an utterly disastrous and costly attack. The land in the Aubers/Fromelles/N Chapell area is low lying and it was not possible to dig trenches or deep dugouts in the area. Defences were based on breastworks and fortified buildings. Today many remains of German concrete shelters can be seen, most being concrete encasing corrugated steel, a common design used by both sides. Some are however quite substantial. One German observation post was built inside an existing building as camouflage, the building long gone but the observation post still surviving! Adolf Hitler is said to have sheltered in one of the bunkers during his First War service. Image No 6: Interior of Image No 5. Image No 7: Shelter in which Hitler is said to have sheltered in. Image No 8: Another shot of 'Hitler's bunker'. Image No 10: Australian memorial at 'VC' corner with ruined German bunkers. Continued mapping at Westleton today. Had a good look at the second dugout with concrete roof, not sure if I did not look properly the first time but today got a good idea how it was constructed. Basically a 'L' shaped trench was dug, revetted with corrugated sheets and 2" poles which were windlassed. 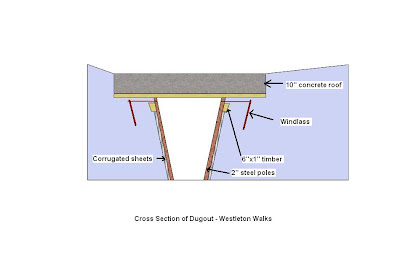 The 10" concrete roof was constructed on site with 6x1 wood shuttering (at least from the bottom) which is clearly visible. Have attached some photos along with a Google sketchup cross-section. I had to limit the recording today as I am collecting data far faster than I can process. Hence took the opportunity to have a good stomp around and found yet more earthworks! Many hours of mapping to go yet! Well at the end of the week off to the Somme for eight days. Hope to post some blogs on this trip even though its not within the remit of this project, so if you follow this blog, don't panic if you find yourself reading about WW1 in the next few posts. Ended up after a good days walking in the churchyard at Dunwich where three Commonwealth War Graves are to be found - one of an unknown merchant seaman, one of a marine (H Booth) on HMS Watchful and a gunner (WPG Evans) of 107th Medium Regt, R.A.
A quick search on Google revealed the following details on HMS Watchful. It was built in 1935 on the order of E.W Longfeld of Great Yarmouth as a pleasure steamer and originally named Britt. It was taken over by the Admiralty on Sept 16th 1939 for war duties and apparently sailed to Dunkirk and back on three occasions saving 900 lives on the evacuation. It spent the rest of the war on anti-submarine and mine sweeping duties, based at Great Yarmouth. It was returned to its owners on Dec 12th 1945. Details on WPG Evans are a bit confusing - the gravestone gives his Regt as 107th Medium Regt (part of 9th Army Group, Royal Artillery (AGRA)) while the details on the Commonwealth War Graves Commission website give it as 107th (The South Notts Hussars) Regt (part of 4th AGRA). There is also a slight discrepancy between the register and gravestone on date of death. Wish I had the time to look further into this. I am doing this blog and website because I enjoy looking into the whole subject, but we should never forget the grim reality of this period in history, or forget the sacrifice made by the armed services during this war. Dunwich Coast Battery now on the website. Sun 7th March - visited Dunwich area today. In the large (and free car park!) can be found some anti-tank cubes and a twin Vickers machine gun pillbox. The cubes are no longer in their original location and have been used to reinforce the rear of the shingle ridge, with fishing sheds/boat winches placed on top. At least 52 remain and they are approx 3 ft cubes. The pillbox, mostly hidden with corrugated sheet is a twin Vickers machine gun pillbox. One of the embrasures can be seen from the nearby field. More or less sheltered from the elements, some of the camouflage paint has remained around this embrasure. Remains of turf camouflage on the roof can also be seen. The 1/7th Middlesex did have a Vickers machine gun section in the area during 1940/41 but the grid ref I have puts the guns a little to the north of the pillbox, but it could be that the grid ref is slightly out? The field of fire of the pillbox would have meant a hail of fire in enfilade along the beach and fields to the north of Dunwich. Top photo - anti-tank cubes. Second down - twin Vickers machine gun pillbox. Third and forth down - camouflage paint clearly visible around one of the embrasures. Bottom - field of fire along the beach from the right hand embrasure. These photos show one of the remains of the Southwold battery - the base of one of the Fighting Lights (or search light). On the way home stopped of at Middleton to photograph this type 22 guarding the road bridge over the Minsmere River. The pillbox has a separate blast wall (with embrasure), metal paltes above each embrasure and is also flooded inside.